I have been MIA but am glad to say I am back. Yesterday was my last day of school! Yay!!! No more kids for 2 months but I know that I will miss my kids. But anyway, now it is time for relaxing, running, and taking vacations. Yes, I will be going on vacation for 3 weeks to Mexico, Ecuador and Peru. So excited!! 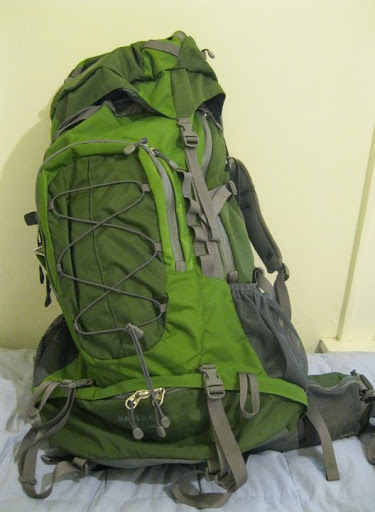 Below is a photo of my backpack! Yes, I have to pack L-I-G-H-T-L-Y!! Anyway, this is week 2 of my Hartford Marathon Training Program. I am doing the Hal Higdon Intermediate II. So far it is going well. On Sunday I set up to do 10 miles but I am blaming it on humidity and was only able to do 8. I made a mental note to get out on the lakefront earlier, say like 6am and not 7:30. I am worried because I will be missing about 3 weeks of the plan. I might be able to do Week 3 and part of Week 4. I will miss Week 5 and part of Week 6. I won’t be able to run but I will be doing a lot of walking/hiking. Should I be worried? Any suggestions/thoughts? I guess I can just enjoy my time off and worry about it when I get back and see how I feel. Well, that is all for now. I am going to REI to return and get more stuff for my trips.